I thought this day would not come in my life time.It brings tears in my eyes to wake up each morning to see that this is not some dream or some movie that I seen but it is real.I thought that we would live in peace for some time.I am sorry for all the loses and I hope we get back up on our feet.I was also wondering I hope this is not what it took for us to wave our American flags high in the sky.We should be so proud of our country that we should have flags everywhere.There will be a picture stuck in everyones head one so tragic,one so sad,one so shocking to me.I am still shook by this happening.I just hope we pull out of this one.This tragic time will be stuck with me forever cause I know I cant be in the war cause I am only 16 but I am a proud American and I would love to be in there to stand up for my country.I know that war is not good but I am not just going to sit here and do nothing about this attack.I am very proud to be an American and you should to cause you have no idea of how many people in different countries would love to be in Americans shoes.Most people from countries that have wars all the time would love to be in a country where they dont have to worry about that as much.They would love to have freedom and I hope that all of you will have those American flags waving in the air like you never have before.May God bless this land we live on and all the people on it and pull us all out of this time of need. The worst terrorist attack in U.S. history, two hijacked commercial jetliners crashed into the World Trade Center in New York City around 9 a.m. Tuesday, toppling both 110-story towers, where thousands of people had just arrived for work.Such a sad picture.One that will be stuck in our minds and our hearts forever. 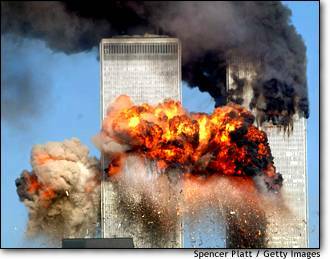 I am sorry for all the families that lost their loved ones on that tragic day.